Preparation of low-cost adsorbent from waste glass for the removal of heavy metals from polluted water. Citation: Rashed MN, Gad AA, AbdEldaiem AM. Preparation of low-cost adsorbent from waste glass for the removal of heavy metals from polluted water. J Ind Environ Chem. 2018;2(2):7-18. Water pollution with heavy metals has become one of the most environmental problems nowadays. To find a suitable green environmental solution for this problem low cost adsorbent in this study was prepared from waste glass. An effective new green adsorbent was synthesized by hydrothermal treatment of waste glass, followed by acidic activation of its surface by HCl. The prepared adsorbent was characterized by SEM, XRF, XRD, and BET surface measurement. Batch experiments were conducted to test the optimum conditions of the prepared adsorbent for the removal of Cd, Cu, Fe, Pb and Zn from their solutions. The experiments of the heavy metals adsorption by the developed adsorbent were performed at different metal ion concentrations, solution pH, adsorbent dosage and contact time. Langmuir and Freundlich adsorption isotherms and kinetic models were used to verify the adsorption performance. The results indicated high removal efficiencies (99-100%) for all the studied heavy metals at pH 7 and a constant contact time 2 h. The data obtained from adsorption isotherms of the metal ions at different times fitted well to linear form of the Langmuir sorption equation, and pseudo-second-order kinetic model. Application of the resulted conditions on well water demonstrated that the modified waste glass adsorbent successfully adsorbed heavy metals (Cd, Cu, Fe, Pb and Zn) from its. Pollution with toxic pollutants in the water body and wastewater has been increased nowadays as the result of different activities (industrial, agricultural and mining) . Water pollution by heavy metals is of great concern due to the discharge of industrial wastewater to water surface, and to its difficulty of biodegradability . Toxic heavy metals are hazardous for living organisms, in which they have accumulated and cannot be degraded, and so they represent a risk for human beings . The removal of heavy metals from wastewater, surface water, and ground drinking water has attracted considerable attention. In recent years, different heavy metals removal methods (including flotation, chemical precipitation, reverse osmosis, biosorbtion, solvent extraction, ion exchange, membrane separation, and adsorption) have been developed for wastewater treatment [4-7]. Adsorption is one of the widely used techniques for heavy metals removal from wastewater. It has been an economic and efficient treatment for inorganic pollutants (includes heavy metals), and organic pollutants from polluted waters. Several adsorbents have been used for treatment of polluted water and wastewater [8-11]. Material recycling has been widely used today. Glass waste as one of these types of materials was recycled for several purposes. More than 2,500,000 tons of used glass bottles have been produced every year since 1995, while only around 60% of the total amount of glass bottles used was reused . Research studies have been carried out to develop low-cost adsorbents. Used recycled porous glass bead was used to adsorb heavy metal ions from water. The porous glass beads show good ion exchangeability [13-14]. Modifiers contained in the porous glass, namely Na+, Ca2+, and Mg2+ could exchange with metal ions with higher electro-negativities or hydrogen ions as proven . Some properties make ordering silica materials attractive for a wide range of applications such as selective adsorption . Ibrahim et al. used recycled waste glass for the adsorption of Cd (II), Cu (II) and Pb (II) from polluted solution. Ilkay et al. used glass beads-immobilized calixarenes derivative as a new sorbent in sorption and removal of heavy metal ions from their solutions. Catalfamo et al. studied the uses of glass residue as adsorbent for the removal of heavy metals from wastewater. Ryoji et al. studied the ability of porous glass material (PGM) to adsorb phosphate. Liying et al. studied the evaluation of doped mesoporous bioactive glass as adsorbent and its photocatalyst for removal of methylene blue from aqueous solution. Heavy metal bioremediation from polluted water using glass-ceramic materials was studied by Garcia et al. . The aim of this study is to focus on converting waste glass residue to eco- friendly and green adsorbent, followed by its application for the removal of heavy metals from well drinking water. Waste glass samples: Waste glass bottles were collected from the house residues. The bottles were washed with tap water, followed by deionized water, crushed and ground to powder with a laboratory agate mortar and pestle to size -63 μm. The sample was oven dried at 105°C, and stored for subsequent use. The collected waste glass sample was made of silicate glass which is a type of glass with the main glass-forming constituent's silica. Typically, the resulting glass (WG) composition is about 59.7 wt. % SiO2, 25.1 wt. % Na2O, 9.8 wt. % MgO, and 4.9 wt. % CaO. Well water samples: Well water samples were collected from two different areas from the west and east the River Nile sides at Qena governorate, Upper Egypt, Egypt. One liter of the well water was collected in a clean glass bottle, filtered and stored at -4ºC until use. All reagents used in the experiments were of analytical grade. Hydrothermal treatment of waste glass was processed according to Wange et al. , in which the mixture of the waste glass powder WG (63 μ) (20 g) and the distilled water (30 mL) was transferred into a Teflon container with 40% volume filling in the autoclave. The autoclave was put into an oven for heating and hydrothermal reaction was conducted at 180°C for 2 h. The waste glass adsorbent was separated by filtration and washed several times with deionized water . The obtained waste glass adsorbent (WGP) was treated with HCl to replace the metal ions contained in the shell part of porous glass with hydrogen ions . For this modification, the obtained adsorbent (WGP) was treated with 500 mL of 0.5 M HCl acid. The mixture was shaken for 12 h at 160 rpm in a temperature controlled shaker at K. The modified WGP was separated from the solution through filtration and washed with deionized water until the washing water pH becomes neutral. The surface morphologies of the prepared activated waste glass adsorbent (WGP) were examined by SEM (SEM, JSM-6460LV, JEOL, Japan), scanning electron microscopy, X-ray fluorescence (XRF), X-ray diffraction (XRD), and BET surface measurement. XPF measurements were performed using a Thermo Scientific ESCALAB250 spectrometer (Thermo VG, USA) equipped with an Al-Ka X-ray source (1486.6 eV). The specific surface area and pore diameter of the samples were determined by nitrogen adsorption-desorption experiments at a temperature of 77 K with an automated sorptometer (Quantachrome Autosorb NOVA2200e, USA). The X-ray diffraction (XRD, Brukeraxs D8, Germany) using Cu Kα radiation (λ= 0.15405 nm) and a secondary monochromator in the 2θ range from 10 to 70º was used to appreciate the crystalline phase, the phase composition, relative crystallinity and crystallite diameter. The following batch adsorption experiments were carried out to determine the optimum conditions for the adsorption process of the selected heavy metals (Cu2+, Cd2+, Fe2+, Pb2+ and Zn2+). Batch adsorption experiments included: pH, contact time, adsorbent dose and initial metal concentration. Effect of pH on metal adsorption: The synthesized absorbent (WGP) was stirred with 50ml of 50 mg/l single ion standard solution (Cu2+, Cd2+, Fe2+, Pb2+ and Zn2+) for 30 min by electrical motor (500 rpm). Solution pH was varied at 2, 5, 7 and 9 and adjusted using a pH meter and HNO3 and NaOH solution. The solution was filtrated by Whatman filter paper No. 42 and the metal ions in the filtrate were measured by atomic absorption spectroscopy. Effect of adsorbent dose: Different amounts (0.5, 1 and 1.5 g) of WGP adsorbent were stirred with 50 mL of 50 mg/L metal standard solution (Cu2+, Cd2+, Fe2+, Pb2+ and Zn2+) at pH 7 for 30 min by electrical motor (500 rpm). The mixture was filtered off and the metal ions were measured by atomic absorption spectrophotometer. 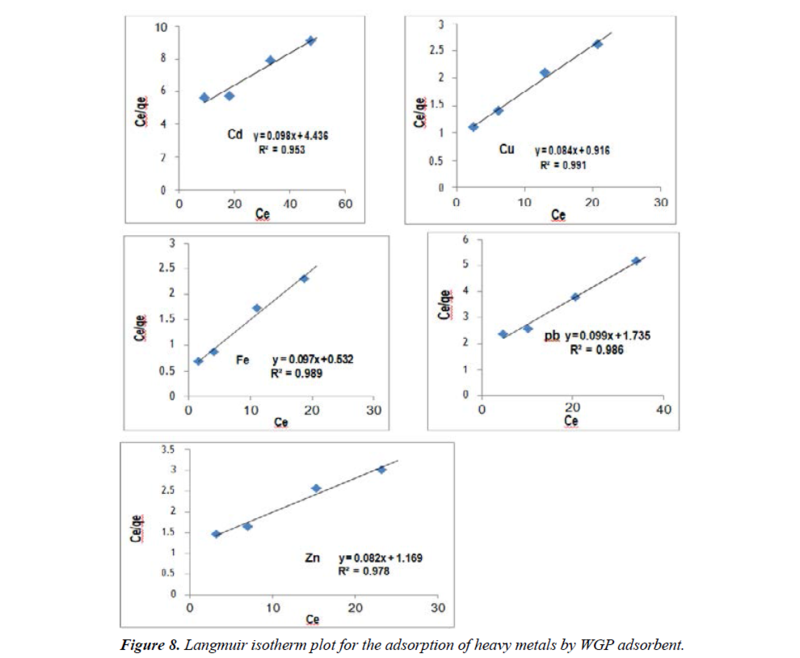 Effect of contact time on metal adsorption: 1.5 g of WGP adsorbent was stirred with 50 mL of 50 mg/L standard metal solution (Cu2+, Cd2+, Fe2+, Pb2+and Zn2+) at pH 7 for different contact times (15, 30 and 45 min). The mixture was filtered off and the metal ions were measured by atomic absorption spectrophotometer. Effect of solution temperature on metal adsorption: The effect of solution temperature on metal adsorption was investigated at constant contact time 45 min, and pH7. The solution was filtrated by Whattman filter paper No 42 and the metal ions in the filtrate were measured by atomic absorption spectroscopy. XRD is an important method to determine the phase of the prepared adsorbent. Figure 1 shows XRD patterns of the waste glass powder (WG) and the prepared adsorbent (WGP). There is no sharp peak observed, and this indicates that both WG and WGP are in amorphous phase. A broad peak, ranging from 10º to 40º, indicates WG and WGP amorphous property. After hydrothermal treatment, the adsorbent WGP still mainly consisted of amorphous materials Figure 1a and 1b. Figure 1a: X-ray diffraction (XRD) patterns of the waste glass WG before treatment. Figure 1b: X-ray diffraction (XRD) patterns of hydrothermally treated waste glass WGP after treatment at 180⁰C for 12 h.
Figure 2 shows SEM micrographs of WG and WGP surfaces. It is observed that WG raw waste glass particles is irregular and smooth surface After the hydrothermal treatment (WGP) , the morphology of the WG surface was changed greatly and the surface was exfoliated fragments stuck on the surface with corroded and rough with fine flaky bulges on WGP surface, which might be crystalline calcium silicate and sodium silicate. The change of WGP surface resulted in the variation of specific surface area of WG. Surface area of WG and WGP were checked by BET measurement. The results showed that the specific surface areas for WG and WGP were 1.22 m2/g and 13.73 m2/g respectively. Data from X-ray fluorescence (XRF) of WG and WGP showed that the elemental composition in WG were Si (55.93%), Mg (1.11%), Al (0.521%), Ca (36.254%) and Fe (0.62%), while in WGP it were Si (55.76%), Mg (1.31%), Al ( 0.478%), Ca ( 37.79%) and Fe (0.63%). This indicates that there was no change in the elemental composition after the hydrothermal treatment of WG Figure 2. Figure 2: Micrographs of waste glass (WG) before treatment (A), and after hydrothermal treatment (WGP) (B). 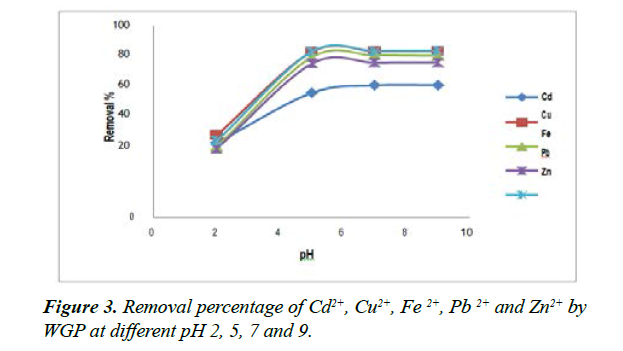 Effect of pH on metal adsorption: The effect of pH on the metal uptake (Cd2+, Cu2+, Fe2+, Pb+2 and Zn2+) using WGP adsorbent is very important parameter. The concentration of the metal ion uptake from the single metal ion solution was examined for different pH values (2, 5, 7 and 9) and represented in Figure 3. Figure 3: Removal percentage of Cd2+, Cu2+, Fe 2+, Pb 2+ and Zn2+ by WGP at different pH 2, 5, 7 and 9. The results show that the removal percentage of Cd2+, Cu2+, Fe2+, Pb+2 and Zn2+ ions by WGP adsorbent increased with the increase of pH from 2 to 9. At pH 2, low uptake of metal ions was noted; this is probably due to the competition effect with H3O+ ion. The small adsorption appears at low pH and it is often attributed to a competition between and metal ion on the same sites . Hence the low removal yield of metal ions is due to the electrostatic repulsion forces between positively charged H3O⁺ (Sorbent surface) and metal ions. At pH 5 metal ion adsorption sharply increased and reached to plateau value at a pH range of 5 to 7. The increase of pH, cause an increase in the negative charge density on the surface which is due to the deprotonisation of positively charged groups on the surface (sorbent surface). 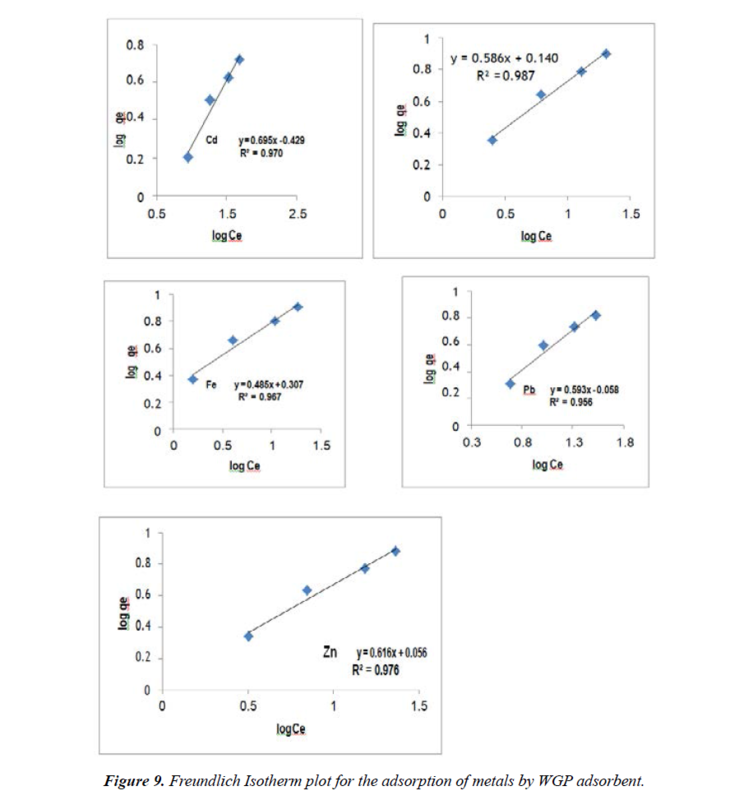 Thus, the most suitable pH values for the maximum adsorption of all metal ions were found at pH (5-7), while after that, pH values increased slowly at pH 9 as the result of precipitation. Oshima et al. investigated the adsorption behavior of the metal ions using mesoporous silicate, MCM-41, and found that the optimum pH for the adsorption was at 6.2. Givianrad  studied the use of activated carbon and silica aerogel for removal of cadmium ions from aqueous solutions and found that Cd2+ adsorption by adsorbents was performed at pH 6.0. The adsorption of heavy metals Cd(II), Cu(II) and Pb(II) by recycling waste glass powder was investigated and found that the maximum metal adsorption was at pH 5.6 . Removal of heavy metals Cd(II) and Fe(II) ions from aqueous solutions by snail shell powder as adsorbent reveals that the optimum adsorption value was at pH 7 . The maximum adsorption of Cu2+ ion by glass containing the ligand at pH 5.5 was studied by Zaitoun et al. . Harry et al. reported that the optimum value of pH is 5 which give the best removal of Cr ions onto silica modified with 2- Mercaptoimidazol Ibrahim et al. studied the recycled waste glass powder as adsorbent for the removal of Cd (II), Cu (II) and Pb (II) ions. The maximum sorption capacity was at pH 6. These results from the previous literatures were agreed with our result of pH measurement. Effect of contact time on metal adsorption: Contact time is an important parameter for the efficiency of removing pollutants in the treatment process. The adsorption data for the removal of Cd2+, Cu2+, Fe2+, Pb2+ and Zn2+ by WGP adsorbent at different contact times (15 , 30 and 45 min ) under the same experimental conditions ( metal initial concentration 50 mg/L, adsorbent dose 1.5 g and pH 7) were studied and represented in Figure 4 and Table 1. 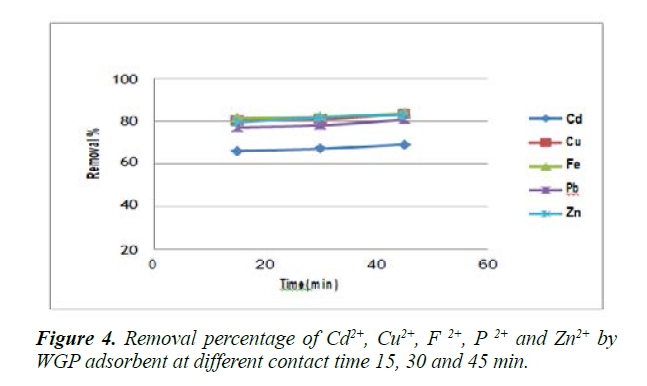 Figure 4: Removal percentage of Cd2+, Cu2+, F 2+, P 2+ and Zn2+ by WGP adsorbent at different contact time 15, 30 and 45 min. The results revealed that the adsorption of Cd2+, Cu2+, Fe2+, Pb2+ and Zn2+. Table 1. The adsorption data for the removal of Cd2+, Cu2+, Fe2+, Pb2+ and Zn2+ on WGP adsorbent at different contact time 15, and 3, 45 min. Increased slowly from 15 min to 30 min and it gives a maximum percentage of metal adsorption at 45 min. So, 45 min as a contact time was enough to achieve maximum adsorption for metal ion on the surface of WGP. This might be due to the nature of the sorbent and its available sorption sites that affect the time needed to reach equilibrium . Ibrahim et al.,  reported that 60 min contact time was enough for maximum adsorption of Cd(II), Cu(II) and Pb(II) using recycled waste glass as adsorbent . The removal of Cu (II) increases with time and attains saturation in 60 to 120 min by using Zeolite NaX as adsorbent . The removal of Cu2+ increases rapidly until it reached an equilibrium state after 45 min by using bentonite treated with ammonium chloride . Karthikeyan and Sivaillango  studied the effect of time on the adsorption of metals iron(III), copper(II) and cobalt(II) ions using activated carbon prepared from recinius communis and found that the adsorption increases with increasing contact time. 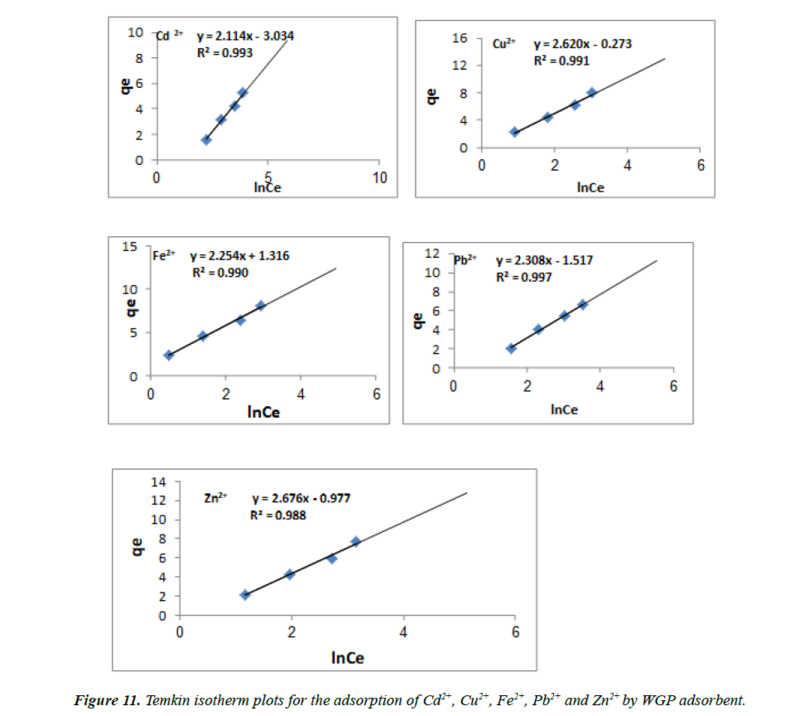 The adsorption data for the removal of Cd2+, Cu2+, Fe2+, Pb2+ and Zn2+ by WGP adsorbent at different doses (0.5, 1.0 and 1.5 g) under the same experimental condition parameters (initial concentration; 50 mg/L; at pH 7) were studied and represented in Figure 5. It was observed that WGP doses of 1.5 g reveals higher removal percentage of Cd2+, Cu2+, Fe2+, Pb2+ and Zn2+ (68%, 88%, 88.7%, 87.6%, 86%, respectively) than with the other WGP doses. The order of the amount adsorbent dose for the removal of Cd2+, Cu2+, Fe2+, Pb2+ and Zn2+ follows in order as WGP 1.5 g> WGP 1 gm > WGP 0.5 g. Thus WGP 1.5 g was selected for all the adsorption experiments in which it has a higher removal of Cd2+, Cu2+, Fe2+, Pb2+ and Zn2+ than with the other adsorbent doses. Metal ion removal was noted to increase with the increase of the amount of adsorbent, because of the greater availability of the adsorbing surface area. The increasing in the amount of adsorbent enhances the removal of metal ions until it reaches the optimum dose Figure 5. 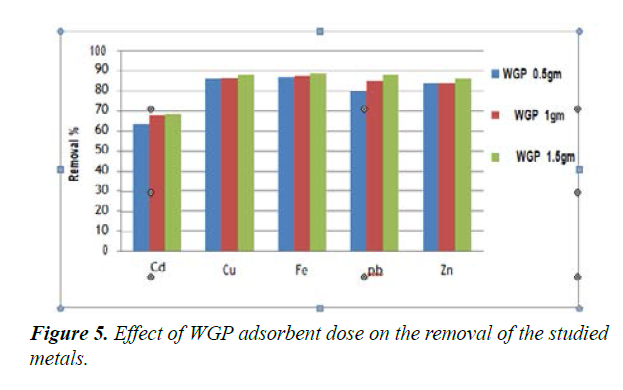 Figure 5: Effect of WGP adsorbent dose on the removal of the studied metals. Givianrad et al.,  used silica aerogel / activated carbon for the removal of cadmium ion from polluted water, and found that the removal percentage of cadmium increases with increasing the amount of adsorbent from 0.02-0.10 g and fixed at greater amount 0.10 g. Ajay et al.,  reported that the removal percentage of Cd, Pb, Hg, Mn, Ni and Zn ions increases rapidly with the increase in the amount of chemically (Na2S) treated granular activated carbon. Moyo et al.,  studied the effect of biomass dosage on the biosorption of Pb(II) ions, and found that the removal increases with increasing in amount of dose from 0.1 to 1.2 g.
Effect of initial concentration on metal adsorption: Figure 6 represented the effect of initial metal concentrations (Fe, Cu, Zn, Pb and Cd) on its adsorption. It was revealed that at low heavy metal concentration, the removal percentage was high and gradually decreases with the increase of heavy metal concentration. At 25 ppm of heavy metals concentration, the removal percentages were 88, 87.3, 83.5, 82.7 and 76% for Fe, Cu, Zn, Pb and Cd, respectively. At 25 ppm, iron was the metal with the highest removal percentage at all concentrations, followed by Cu, Zn, Pb then Cd which had the lowest removal percentage. On the other hand, the highest heavy metal concentration (100 ppm) led to the lowest removal percentage of the studied heavy metals (54.2, 73.7, 75.3, 76.8 and 77.7% for Cd, Zn, Pb, Cu and Fe, respectively). The removal percentage of all the tested metals was the highest at 25 ppm and decreased with the increase in metal concentration. El-Ashtoukhy et al.,  explained that at low concentrations, metals are adsorbed by specific sites, while with increasing metal concentrations the specific sites are saturated and the exchange sites are filled leading to less adsorption efficiency. Salim and Yukihiro  reported that the maximum adsorption of Pb2+ by silica ceramic adsorbent was at 50 mg/L. 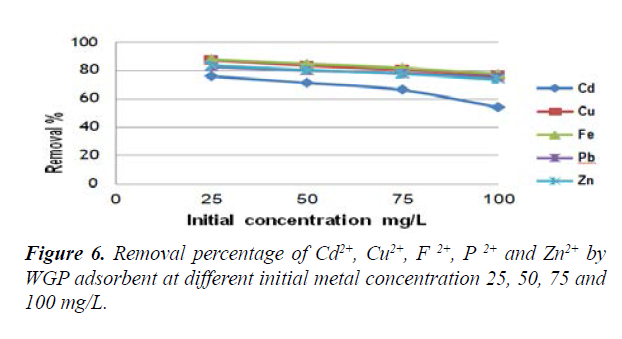 Figure 6: Removal percentage of Cd2+, Cu2+, F 2+, P 2+ and Zn2+ by WGP adsorbent at different initial metal concentration 25, 50, 75 and 100 mg/L. Effect of temperature on metal adsorption: The effect of solution temperature on the adsorption efficiency of the studied heavy metals is presented in Figure 7. The results show that with the increase of solution temperature from 25ºC , the adsorption removal percentage of Cd2+, Cu2+, Fe2+, Pb2+ and Zn2+ ions increased until reaching high adsorption at 45ºC (75.2%, 85.9%, 85%, 82.9% and 88.6% for Cd2+, Cu2+, Fe2+, Pb2+ and Zn2+ ions respectively). Therefore, it is revealed that the adsorption process is endothermic. Figure 7: Removal percentage of Cd+2, Cu2+, Fe2+, Pb2+ and Zn2+ by WGP adsorbent at different temperatures 25, 35 and 45ºC. The increase of heavy metal adsorption with temperature may be attributed to increase in the number of active sites available in the adsorbent surface, or the desolvation of the adsorbing species and the decrease in the thickness of the boundary layer surrounding the adsorbent with temperature, so that the mass transfer resistance of adsorbate in the boundary layer decreases . Effect of temperature on removal of Pb ion using silica ceramic was studied by Salim and Yukihiro  their results revealed that Pb uptake increases when temperature of the solution increases from 20 to 30ºC, and the adsorption is the highest at 40ºC. The adsorption isotherms are fundamentally important in the design of adsorption system. The adsorption isotherms are usually the ratio between the quantity adsorbed and that remaining in the solution at fixed temperature on the equilibrium. The most commonly used adsorption models are Langmuir, Freundlich, Temkin and Dubinin- Radushkevich isotherms. Langmuir isotherm: The Langmuir isotherm is represented by the following equation. Where Ce is the equilibrium concentration (mgL-1), qe is the amount of adsorbate at equilibrium (mg/g), b is the sorption constant (mgL-1) (at a given temperature) related to energy of sorption, Q0 is the maximum sorption capacity (mgg-1). The linear plots of Ce/qe versus Ce suggest the applicability of the Langmuir isotherms. Values of Q0 and b were determined from the slope and intercepts of the plots. The resulting data are represented in the Figure 8 and listed in Table 2. The maximum adsorption for Cd2+, Cu2+, Fe2+, Pb2+ and Zn2+ on WGP were 10.204 mg/g, 11.904 mg/g, 10.309 mg/g, 10.101 mg/g, and 12.195 mg/g, respectively. These values indicated that the order of metal ions according to their affinity to adsorption on WGP were Zn2+ > Cu2+ > Fe2+ > Cd2+ > Pb2+. The correlation coefficient for the adsorption of Cd2+, Cu2+, Fe2+, Pb2+ and Zn2+ onto WGP were 0.953, 0.991, 0.989, 0.98 and 0.978 respectively. The fit to the linear form models was examined by calculation of the linearity coefficient (R2). Regression values (R2) were presented in the Table 2 and indicates that the adsorption data for Cd2+, Cu2+, Fe2+, Pb2+ and Zn2+ fitted better the Langmuir model than the freundlich model for all adsorbents. Figure 8: Langmuir isotherm plot for the adsorption of heavy metals by WGP adsorbent. Table 2. Langmuir and Freundlish parameters for the adsorption of Cd2+, Cu2+, Fe2+, Pb2+ and Zn2+ by WGP adsorbent. Where qe is the amount of metal ions adsorbed per unit weight (mgg-1 adsorbent), Ce is the equilibrium concentration (mgL- 1) of adsorbate, and Kf and n are Freundlich constants. When log qe is plotted against log Ce a straight line with slope 1/n and intercept log Kf is obtained. The intercept of line log Kf is roughly an indicator of the adsorption capacity, whereas the slope, 1/n is an indicator of adsorption intensity. The Freundlich parameters for the adsorption of metal ions given Figure 9 and listed in Table 2. Figure 9: Freundlich Isotherm plot for the adsorption of metals by WGP adsorbent. From Freundlich constant, the values of 1/n for adsorption on WGP adsorbent were 0.69, 0.58, 0.48, 0.59 and 0.61 for Cd2+, Cu2+, Fe2+, Pb2+ and Zn2+ respectively. The previous values of 1/n less than 1 indicate that the metal ions are favorably adsorbed by WGP Figure 9. Dubinin-Radushkevich isotherm: The Dubinin-Radushkevich (D-R) isotherm model was applied to the data in order to deduce the heterogeneity of the surface energies of adsorption and the characteristic porosity of the adsorbent. The linear form of the D-R isotherm is given in Equation 5. Where R is the ideal gas constant (R=8.314 J/mol K) and T is the absolute temperature (K). By plotting ln qe vs Ɛ2, it is possible to determine the value of B from the slope and the value of qm from the intercept, which is ln qm. The mean free energy E (KJ/mol) of sorption can be estimated by using B values as expressed in the following equation. If the value of E lies between 8 and 16 kJ/mol the sorption process is a chemisorption one, while values less than 8 kJ/mol indicate a physical adsorption process . The Dubinin-Radushkevich (D-R) parameters for the adsorption of metal ions is given in Figure 10 and listed in Table 3. From Dubinin constant, the values of E for adsorption on WGP adsorbent were 0.158, 0.5, 0.79, 0.316 and 0.408 for Cd2+, Cu2+, Fe2+, Pb2+ and Zn2+ respectively. The values of E are less than 8 kJ/mol indicate a physical adsorption process between WGP adsorbents and the adsorbate. Figure 10: Dobinin-Radushkevich Isothermal plot for the adsorption of Cd2+, Cu2+, F 2+, P 2+ and Zn2+ by WGP adsorbent. Table 3. Dubinin-Radushkevich (D-R) and Temkin parameters for the adsorption of Cd2+, Cu2+, Fe2+, Pb2+ and Zn2+ by WGP adsorbent. The Temkin isotherm: Temkin isotherm model contains a factor that describes adsorbing species- adsorbate interactions . This model assumes the following: (i) the heat of adsorption of all the molecules in the layer decreases linearly with coverage due to adsorbate-adsorbent interactions, and (ii) adsorption is characterized by a uniform distribution of binding energies, up to some maximum binding energy. The derivation of the Temkin isotherm assumes that the fall in the heat of sorption is more linear rather than logarithmic, as implied in the Freundlich equation. The Temkin isotherm has commonly been applied in the following form (Equation 8). Where constant BT = RT/bT, which is related to the adsorption heat, R is the gas constant (8.314 J/mol K), T (K) is absolute temperature in Kelvin, bT (J/mol) is the Temkin isotherm constant, which is the variation of adsorption energy and Kt (L/mg) is the equilibrium binding constant corresponding to the maximum binding energy. Both Bt and Kt can be calculated from the slope and the intercept of the linear plot based on qe versus lnCe, respectively. The Temkin parameters for the adsorption of metal ions given Figure 11 and listed in Table 3. From Temkin constant, the value of Kt for the adsorption on WGP was 0.238, 0.901, 1.792, 0.518 and 0. 694 for Cd2+, Cu2+, Fe2+, Pb2+ and Zn2+ respectively and the value of Bt for the adsorption on WGP were 2.114, 2.62, 2.524, 2.308 and 2.676 for Cd2+, Cu2+, Fe2+, Pb2+ and Zn2+ respectively. Low values of Bt and Kt indicate a weak interaction between adsorbent and adsorbate supporting a mechanism of ion exchange. The parameters and the regression coefficients of Temkin model are presented in Table 3. Higher values of the coefficient of correlation show a good linearity regardless of the maximum capacity of adsorption used to calculate the coverage area. The value of bt (variation of the adsorption energy (J/mol)) is positive, which indicates that the reaction of the adsorption is exothermic. Figure 11: Temkin isotherm plots for the adsorption of Cd2+, Cu2+, F 2+, P 2+ and Zn2+ by WGP adsorbent. Kinetic models are helpful to understand the mechanisms of metal adsorption, and so it evaluates performance of the adsorbents for metal removal. The kinetics Cd2+, Cu2+, Fe2+, Pb2+ and Zn2+ ions adsorption onto WGP adsorbent is required for selecting optimum operating conditions that are helpful for the prediction of adsorption rate. Lagergren pseudo-first-order and pseudo-second-order kinetic models were used for the adsorption of Cd2+, Cu2+, Fe2+, Pb2+ and Zn2+ ions onto WGP adsorbent. Where, qe (mg/gm) and qt (mg/gm) are the amount adsorbed on the sorbents at equilibrium and at time t, respectively; kf (min- 1) is the rate constant of pseudo-first-order kinetic model and t (min) is the agitation time. The slopes and intercepts of plots of log (qe - qt) versus t were used to determine the pseudo firstorder constant kf and equilibrium adsorption density qe. The plot t/qt versus t should give a straight line if pseudosecond- order kinetics is applicable and qe, k and h can be determined from the slope and intercept of the plot respectively. The pseudo-first-order and pseudo-second-order rate constants determined are presented in Table 4 along with the corresponding correlation coefficients. Table 4. Parameters of the kinetic models (pseudo first-order and pseudo second order for the adsorption of Cd2+, Cu2+, Fe2+, Pb2+ and Zn2+ onto WGP adsorbent. From pseudo-first-order rate constant, the obtained values of qe for adsorption on WGP adsorbent were 0.2495, 0.151, 0.1455, 0.5035 and 0.4187 mgg-1 for Cd2+, Cu2+, Fe2+, Pb2+ and Zn2+ respectively. The previous values of qe are decreasing with increasing in initial meal concentrations, which indicated that the values of qe from the pseudo first-order kinetic model did not give reasonable values, and also did not agree very well with the experimental data. This suggests that the adsorption of Cd2+, Cu2+, Fe2+, Pb2+ and Zn2+ ions by WGP are not a pseudo first-order-reaction. As shown in Table 4, first-order linear correlation coefficients are best between 0.901 and 0.999. In contrast, second-order linear correlation coefficients are best because they are equal to 1 for most heavy metals and are increased by increasing concentrations of Cd2+, Cu2+, Fe2+, Pb2+ and Zn2+ ions. From pseudo-second-order rate constant, the values of qe for adsorption of Cd2+, Cu2+, Fe2+, Pb2+ and Zn2+ on WGP adsorbent were 2.985, 4.386, 0.292, 3.968, 4.31, and 5.917 mgg-1, respectively. The previous values of qe are increased with the increase in initial metal ions concentrations, and this is due to the adsorption of a large number of these metal ions at the available adsorption sites. This is indicated that the values of qe from the pseudo-second-order kinetic model give reasonable values also agree very well with the experimental data. As shown in Table 4, the correlation coefficients for the second order rate equation, for all the metals, are greater than 0.992 or equal to 1(R2 values close or equal to 1) and substantially higher than that for the first-order rate equation. These indicate that the adsorption system studied belongs to the second order kinetic model. The real well drinking water samples were obtained from two different locations, from Abu Tesht (Al-Ka'aimat well west of Abu Tesht and the well of Marharza east of Abu Tesht). Adsorbent sample WGP (1.5 g) was used for adsorption of Cd2+, Cu2+, Fe2+, Pb2+ and Zn2+ ions at optimum pH 7, contact time 45 min and a temperature of 25ºC from real well drinking water samples. The obtained result is tabulated in Tables 5 and 6. The data given in Tables show that the removal percent of metal ions Cd2+, Cu2+, Fe2+, Pb2+ and Zn2+ with WGP adsorbent were highly adsorbed with WGP adsorbent. So, the prepared WGP adsorbent was effective for higher removal efficiency of heavy metals from well drinking water. Table 5. Removal percent of metal ions (Cd2+, Cu2+, Fe2+, Pb2+ and Zn2+) before and after treatment of real well drinking water sample (Al-Ka'aimat well west of Abu Tesht). Table 6. Removal percent of metal ions (Cd2+, Cu2+, Fe2+, Pb2+ and Zn2+) before and after treatment of real well drinking water sample (Al-Maharza well east of Abu Tesht) with WGP adsorbent. Eco-friendly adsorbent was successfully prepared from waste glass by hydrothermal treatment followed by acidic activation of its surface by HCl. The prepared adsorbent was characterized by SEM, XRF, XRD, and BET surface measurement. The developed adsorbent was successfully applied for the removal of heavy metals (Cd, Cu, Fe, Pb and Zn) from well water at the optimum adsorption conditions of pH 7, contact time 45 min, adsorbent dose 1.5 g and temperature 25ºC. Adsorption isotherms (Langmuir and Freundlich) as well as kinetic adsorption models (pseudo first-order and pseudo second-order) were applied and ended to that the adsorption of the studied heavy metals onto the prepared adsorbents fitted well Langmuir and pseudo second-order models. Gardea-Torresdey JL, de La Rosa G, Peralta VJR. Use of phyto-filtration technologies in the removal of heavy metals: a review. Pure and Applied Chemistry. 2004;76(4):801-13. Gupta SS, Bhattacharyya KG. Removal of Cd(II) from aqueous solution by kaolinite and their poly (oxo zirconium) and tetrabuty- lammonium derivatives. Journal of Hazardous Materials. 2006;128(2-3):247-57. Demirbas A. Heavy metal adsorption onto agro-based waste materials: A review. Journal of Hazardous Materials. 2008;157(2-3):220-9. Gupta VK, Ali H. Removal of lead and chromium from wastewater using bagasse fly ash- a sugar industry waste. J Colloid Interf Sci. 2004;271(2):321-8. Karapinar N, Donat R. Adsorption behavior Cu2+ and Cd2+ onto natural bentoniet Desalination. 2009;249(1):123-9. Inglezakis VJ, Stylianou MA, Gkantzou D. Removal of Pb2+ from aqueous solution by using clinoptilolite and bentonite as adsorbents. Desalination. 2007;210(1):248-56. Liu QS, Zheng T, Wang P, et al. Adsorption isotherm, kinetic and mechanism studies of some substituted phenols on activated carbon fibers. Chemical Engineering Journal. 2010;157(2-3):62-6. Immamuglu M, Tekir O. Removal of copper (II) and lead (II) ions from aqueous solutions by adsorption on activated carbon from a new precursor hazelnut husks. Desalination. 2008;228(1-3):108-13. Tangjuank S, Insuk N, Tontrakoon J, et al. Adsorption of lead (II) and cadmium (II) ions from aqueous solutions by adsorption on activated carbon prepared from cashew nut shells. World Academy of Science, Engineering and Technology. 2009;3(4):110-16. Rashed MN. Adsorption technique for the removal of organic pollutants from water and wastewater. In: Book: Organic Pollutants -Monitoring, Risk and Treatment. InTech - open science. 2013;ISBN: 980-953-307-862-0. Nageeb RM, Soltan ME, Ahmed MM, et al. Removal of Heavy Metals from Wastewater by New Adsorbents from Chemical Activation of Sewage Sludge. Environmental Engineering and Management Journal. 2017;16(7):1531-42. Yanagisawa K, Ningzhong B, Liming S, et al. Development of a technique to prepare porous materials from glasses. Journal of the European Ceramic Society. 2006;26(4-5):761-5. Shen C, Wang YJ, Xu JH, et al. Preparation and ion exchange properties of egg-shell glass beads with different surface morphologies. Particuology. 2012;10(3):317-26. Sun YW, Wang YJ, Yang L, et al. Heavy metal ion sorption properties of porous glass beads with a core-shell structure. Solvent Extr Ion Exch. 2008;26(5):672-85. Petrella A, Petruzzelli V, Basile T, et al. Recycled porous glass from municipal/industrial solid wastes sorting operations as a lead ion sorbent from wastewaters. Reactive & Functional Polymers. 2010;70(4):203-9. Ibrahim HS, Nabila SA, Hany HAG, et al. Adsorption of Cd(II), Cu(II) and Pb(II) using recycled waste glass: equilibrium and kinetic studies. Desalination and water treatment. 2012;48(1-3):320-8. Ilkay HG, Seyda CO, Aydan Y. Sorption of heavy metal ions by glass beads-immobilized calixarenes derivative. Protection of Metals and Physical Chemistry of Surfaces. 2013;49(3):266-73. Catalfamo P, Primerano P, Arrigo I, et al. The removal of heavy metals from wastewater by glass residue. Ann Chim. 2006;96(7-8):487-92. Nakazawa R, Tomemori H, Hirano A, et al. Effects of the application of porous glass material treated with phosphate on the growth of tomato plants and the phyto-available phosphate in soil. Soil Science and Plant Nutrition. 2006;52(4):540-4. Liying L, Huanrui S, Lu C, et al. Evaluation of La-Doped Mesoporous Bioactive Glass as Adsorbent and Photocatalyst for Removal of Methylene Blue from Aqueous Solution. International Journal of Photoenergy. 2015;2015:1-11. Garcia AM, Villora JM, Moreno DA, et al. Heavy Metals Bioremediation from Polluted Water by Glass-Ceramic Materials. J Am Ceram Soc. 2003;86(12):2200-2. Wang Y, Zhu K, Wang F, et al. Novel Fe/glass composite adsorbent for As(V) removal. Journal of Environmental Sciences. 2009;21(4):434-439. Kouakou U, Ello AS, Yapo JA, et al. Adsorption of iron and zinc on commercial activated carbon. Journal of Environmental Chemistry and Ecotoxicology. 2013;5(6):168-71. Oshima S, Perera JM, Northcott KA, et al. Adsorption behavior of cadmium(II) and lead(II) on mesoporous silicateMCM-41. Sep Sci Technol. 2006;41(8):1635-43. Givianrad MH, Saber-Tehrani M, Aberoomand-Azar P, et al. Removal of Cadmium Using a Novel Nano Composite Silica Aerogel, Activated Carbon. Journal of Physical and Theoretical Chemistry of Islamic Azad University of Iran. 2011;8(2):141-7. Orodu VE, Olisedeme S, Okpu RC. Removal of Heavy Metals from Aqueous Solutions using Snail Shell Powder as available Adsorbent. International Journal of Science and Technology. 2014;3(7):422-8. Zaitoun M, Momania K, Jaradat O, et al. Synthesis of an Organic Chelate Doped Sol Gel Filter to Remove Cu(II) Ions from Aqueous Solutions. Jordan Journal of Chemistry. 2014;9(2):81-96. Budiman H, Fransiska Sri HK, Setiawan AH. Preparation of Silica Modified with 2-Mercaptoimidazole and its Sorption Properties of Chromium (III). E-Journal of Chemistry. 2009;6(1):141-15. Bhattacharya AK, Naiya TK, Mandal SN, et al. Adsorption, kinetics and equilibrium studies on removal of Cr(VI) from aqueous solutions using different low-cost adsorbents. Chem Eng J. 2008;137(3):529-41. Pandey P, Sambi SS, Sharma SK, et al. Batch Adsorption Studies for the Removal of Cu (II) Ions by ZeoliteNaX from Aqueous Stream. Proceedings of the World Congress on Engineering and Computer Science. Vol I WCECS, October 20-22, 2009, San Francisco, USA. Boukerroui A, Ali O, Mohand SO. Copper (II) Ions Removal From aqueous Solution Using Bentonite Treated with Ammonium Chloride. American Journal of Physical Chemistry. 2012;1(1):1-10. Karthikeyan G, Siva ilango S. Equilibrium Sorption studies of Fe, Cu and Co ions in aqueous medium using activated Carbon prepared from Recinius Communis Linn. Environ Manage. 2008;12(2):81-7. Ajay KM, Chitra RK, Mishra GK. Removal of heavy metal ions from aqueous solutions using chemically (Na2S) treated granular activated carbon as an adsorbent. Journal of scientific and industrial research. 2010;69(6):449-53. Moyo M, Chikazaza L, Nyamunda BC, et al. Adsorption Batch Studies on the Removal of Pb(II) Using Maize Tassel Based Activated Carbon. Journal of Chemistry. 2013;2013:8. El-Ashtoukhy E, Amin N, Abdelwahab O. Removal of lead(II) and copper(II) from aqueous solution using pomegranate peel as a new adsorbent. Desalination. 2008;223(1-3):162-73. Salim MD, Munekage Y. Lead Removal from Aqueous Solution Using Silica Ceramic: Adsorption Kinetics and Equilibrium Studies. Int J Chem. 2009;1(1):23-30. Meena AK, Mishra GK, Rai PK, et al. Removal of Heavy Metal Ions from Municipal Solid Waste Leachate Using Coal Fly Ash as an Adsorbent. Journal of Hazardous Materials. 2005;113:137-44. Sivakumar P, Palanisamy PN. Adsorption studies of basic red 29 by a nonconventional activated carbon prepared from Euphorbla Antiquoruml. International Journal of Chem Tech Research. 2009;1(3):502-10. Temkin MJ, Pyzhev V. Kinetics of ammonia synthesis on promoted iron catalysts. Acta Phusiocim URSS. 1940;12:217-22. Kumara SP, Ramalingamb S, Kiruphac SD, et al. Adsorption behavior of nickel (II) onto cashew nut shell: Equilibrium, thermodynamics, kinetics, mechanism and process design. Chem Eng J. 2011;167:122-31.